Dizzy Lizzy is a Baltimore-based Wig Commissioner, Costume Designer, Fashion Design Grad, Bridal Seamstress, Project Runway Season 9 semi-finalist, a wacky waitress, wife, mother, and a Chinchilla owner. The verdict is out on if she sleeps. Costuming since 2001, she promised her husband she wouldn’t be doing this when she was 30. (She’s 4 years overdue on that promise!) Over the years, DizzyLizzy has performed skits with the Agents of Cosplay and received a number of awards for craftsmanship and presentation. 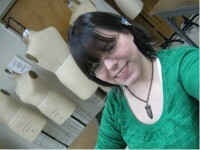 She loves to make costumes, goof off on stage, share knowledge, and hang out/meet friends.